The Donald Bullough Fellowship provides a unique opportunity to become immersed in a rich community of medieval historians. Not many of us, especially at North American universities, enjoy the company of so many scholars whose fields of expertise stretch from Scandinavia to Byzantium, Roman Britain to the fifteenth century, and multifarious geographies, temporalities, and topics in-between. This depth and breadth of scholarship is complemented by weekly seminars by visiting scholars, sponsored by St Andrews Institute for Mediaeval Studies, and other research groups. A couple of seminar presentations stand out to me. One, on spiders in Anglo-Saxon manuscripts, was a fascinating introduction to an unfamiliar research area. Thankfully, the illustrations of spiders did not disturb a real-life arachnophobe. Another speaker reconceptualized the periodization of Germanic Imperial literature in the High Middle Ages, proposing a different series of ebbs and flows in book production. These and all the presentations were a wonderful introduction for post-graduates and also provided exciting new concepts for faculty members. In addition to presenting my own seminar on a reconceptualization of medieval masculinity through masculine embodiment, I also led a workshop on mystical castration, focusing on the fine distinctions of context and experience. The annual Gender and Transgression in the Middle Ages conference was a lovely way to end the semester. Particularly notable was the excellent keynote address by Elizabeth Robertson and terrific discussions with the speakers and graduate students. Additionally, I had the privilege to be invited to give presentations at the University of Aberdeen and the University of Dundee. The main responsibility of the Bullough Fellow is to write. This is necessarily a solitary activity, so much of one’s time is spent alone, but there are opportunities to enjoy the presence of scholarly colleagues. It is the office, the computer, and the library that must capture the attention of the Bullough Fellow as they engage in diligent research and the pursuit of intellectual tidbits from the past that will form the basis of hours of thoughtful deliberation in the future. I was delighted that the St Andrews Library is rich in both current and retrospective secondary sources, and boasts an exceptionally helpful staff and an efficient Interlibrary Loan office, on those rare occasions it might be necessary. All in all, the research support at St Andrews is exceptional. I wrote far more than I had anticipated and I will always remain grateful for the scholarly support, nestled (like the building itself) within the heart of an ancient and noble Scottish city. Living in St Andrews, a city and university of great Scottish antiquity, is rather like being transported into the Middle Ages. Walking the little streets, especially near the cathedral and north port, offers a medieval world view that counteracted the glass and concrete skyscrapers of my daily cityscape. It is not just the fact of the vestiges of medieval houses; rather it is that they can occupy two or three full blocks. Similarly, the ruins tug at the heartstrings: the devastated cathedral, the remnants of the bishop’s palace, and perhaps, worst of all, the destroyed Blackfriars, all bring home the vicissitudes of the Scottish Reformation. I feel very grateful to have spent five months with the medievalists of St Andrews. I am most grateful to have been afforded this extraordinary opportunity, truly a highlight of my professional life. Thank you so much St Andrews!! 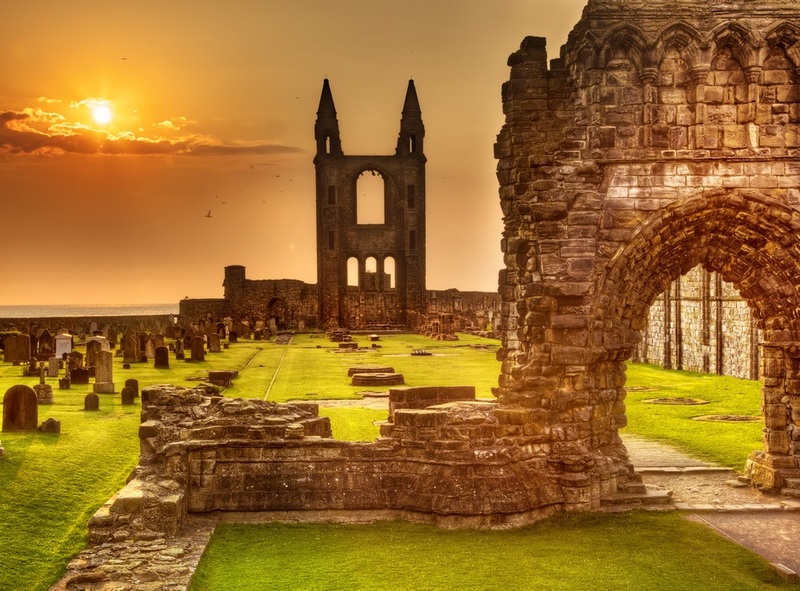 In fall 2016, I had the pleasure of spending a semester as a joint visiting fellow with the Institute of Scottish Historical Research and Reformation Studies Institute at the University of St Andrews. This was an amazing opportunity and experience, both professionally and personally. To state the obvious, S. Andrews is a beautiful historic town with a vibrant intellectual community centered around the university. Here, I was able to pursue my work on a project on sermon-going in early modern Scotland with a huge array of resources at my disposal. The special collections reading room at the Martyr’s Kirk provided a lovely space to dig through manuscripts related to Scotland during the Reformation. The main library at St. Andrews gave me access to many printed and electronic secondary sources. St. Katherine’s Lodge was a warm and scenic place for my office, where I passed many hours working and socializing with staff in the School of History. Living in Fife, I was also only an hour’s journey away from Edinburgh, where I travelled a few times a month for research in the archives or professional meetings. The most important resources, however, were the wonderful staff and students of the Institute of Scottish Historical Research and the Reformation Studies Institute. During my time as an ISHR fellow, I benefited from invaluable conversations with a wide range of scholars, all of whom were incredibly welcoming to me and encouraging of my work. From my seminar presentation on a mass confession in Ayr in 1647 to the informal weekly gatherings over coffee and cake in St. Kat’s, the members of the ISHR helped shape my thinking about my new research. Coming from a small liberal arts college where I am the only historian of Scotland, early modern Britain, or the Protestant Reformation, being surrounded by colleagues working on similar topics was a revelation that pushed me to reframe my research questions in very helpful ways. Equally important, I made not only new scholarly connections, but also wonderful friends while in St Andrews. Both professionally and personally, my time as a joint ISHR-RSI fellow was thus invaluable. I look forward to seeing everyone again on future trips to Fife! I was based at the Institute of Scottish Historical Research as a visiting fellow in the second half of 2016. It was a tremendously enriching experience. Ensconced in Professor Michael Brown’s office (thank you to him!) on The Scores with a view out over the sea, I was able to complete a book manuscript (provisionally) entitled Empire of Dissent: Scottish Presbyterianism and Reform Politics in the British World, c. 1820-c.1850. I presented a chapter on Samuel McDonald Martin, a politician in New Zealand, to the Scottish History seminar and a chapter on Thomas Pringle, a poet in South Africa, to a symposium on Presbyterianism and Scottish Literature. It was rewarding to receive feedback on each of these chapters from an audience so informed about Scotland’s political, religious and literary history. My visit had many highlights: utilising the university’s special collections in the beautiful Martyrs Kirk on North Street; tea and cake with the School’s congenial academic staff on Tuesday mornings; procrastinating with my fellow fellows Mikki Brock and Steve Boardman; and chatting to and learning from ISHR’s wonderfully engaged postgraduate students. Most of all I think I’ll miss the hospitality of the Strathmartine Centre for Scottish History on Kinburn Place, whose library and kitchen kept me well-nourished throughout my stay. The ISHR is delighted to announce that in 2016-17 the ISHR will host two Visiting Research Fellows in the autumn term, Dr Michelle D. Brock from Washington and Lee University, Virginia, and Dr Valerie Wallace from the Victoria University, New Zealand. Dr Michelle D. Brock is an Assistant Professor of British History at Washington and Lee University in Lexington, Virginia. Her research interests centre on religious belief and identity in early modern Scotland. Dr Brock’s first book, Satan and the Scots: The Devil in Post-Reformation Scotland, c.1560-1700, was published with the St Andrews Studies in Reformation History series (Routledge, 2016). She is the author of articles in the Journal of British Studies and Critical Survey, as well as a number of editorials connecting history and pedagogy to current events. While at the ISHR, Dr Brock will be working on project titled Hearing is Believing: The Social Life of Sermons in Early Modern Scotland. This project explores the personal experience and communal event of sermon-going in Scotland from the Reformation through the seventeenth century. Put simply, this work seeks to understand how attending, hearing, and reading regular sermons informed daily lives, social relationships, political convictions, and identities in early modern Scotland. As part of this research, she will be using St. Andrew’s collection of manuscript sources, including sermons, sermon notebooks, diaries, and commonplace books. Dr Brock will also present her research to staff and postgraduate students in the ISHR and Reformation Studies Institute during her fellowship in St Andrews. Dr Valerie Wallace lectures at Victoria University of Wellington in New Zealand. Dr Wallace is a historian of Scotland, Britain and the settler colonies of Britain’s empire in the eighteenth and nineteenth centuries. She is interested in the history of political thought and the intersection of religion and radical politics. While based at St Andrews Dr Wallace will be working on her current book project, Empire of Dissent: Scottish Presbyterianism and Reform Politics in the British World,1820-1850, which aims to transform our understanding of colonial radicalism by documenting the explosive but uncharted influence of Scottish Presbyterian political ideas. The project explores the political careers of five significant, but under-researched, colonial reformers: Thomas McCulloch (1776-1843), a missionary in Nova Scotia; Thomas Pringle (1789-1834), a poet in the Cape Colony; John Dunmore Lang (1799-1878), a church minister in New South Wales; William Lyon Mackenzie (1795-1861), a journalist in Upper Canada; and Samuel McDonald Martin (1805?-1848), a journalist in New Zealand. The project will analyse their connection to a denominational network, uncovering the hitherto neglected history of the Scottish Presbyterian dissenting churches in the British Empire. The ISHR is also delighted to announce that we will host Dr Steve Boardman, Reader in Scottish History at the University of Edinburgh, as Visiting Scholar during the academic year 2016-17. Dr Katie Stevenson appeared on BBC radio in a programme on the Black Death in Scotland. The programme can be heard here. The School of History extends congratulations to Dr Barbara Crawford, who has been awarded the title of Honorary Professor from the University of the Highlands and Islands. She has been active in the Centre for Nordic Studies in Kirkwall – where she is an Honorary Fellow ­– since it opened, and she will continue to be involved with their various teaching and research programmes. The School of History would also like to congratulate Ms Jane Ryder OBE, a St Andrews graduate in Mediaeval and Modern History, who recently became the first chair of the Historic Environment Scotland Board. Ms. Ryder will hold this position from 19 January 2015 until 18 January 2019. Mr Nathan Alexander, a PhD student and Communications Intern in the School of History, recently started a group called the International Society for Historians of Atheism, Secularism, and Humanism (ISHASH) with another PhD student, Mr Elliot Hanowski, from Queen’s University, Canada. The society aims to provide the growing number of scholars in this field with a platform for networking and collaboration. Thus far, members include professors and postgraduates from seven countries. The society’s inaugural conference, to be held at Conway Hall in London, is planned for this year. On 22nd January, Dr Aileen Fyfe spoke at a Café Scientifique in Aikman’s bar, St Andrews. A ‘full house’ turned up to discuss the increasing importance of peer review in science. Dr James Palmer spoke at the ‘Calendars and Religion in Antiquity and the Middle Ages’ workshop at UCL on 18th February. His paper was entitled ‘Calendars, Religion and Order in the Carolingian World (740-900)’. On 18th February Dr Sarah Easterby-Smith gave a paper entitled ‘Paris, Mauritius and Mysore: Diplomatic Botany in 1788’ to the History Department Seminar at the University of Aberdeen. Ms Hambly, Mrs Graham, and Mr Dawson attended the Royal Commission on Ancient and Historical Monuments of Wales Digital Past conference in Swansea on 11th-12th February, where Mr Dawson gave one of the keynote addresses. They also helped organise an event in the Scottish Parliament as part of Scottish Environment Week, including giving a lunchtime presentation in one of the Committee Rooms. Dr Joanna Warson (Portsmouth) presenting her topic on France in Anglophone Africa, chaired by Dr Simon Jackson (Birmingham). On 27th and 28th August 2014, the Centre for French History and Culture of the School of History hosted a conference entitled “France and its Global Histories: State of the Field”. The workshop was generously supported by the Institut français du Royaume-Uni, represented by Dr Catherine Robert during the event. The purpose of the conference was to offer new perspectives on French history, and on the role global history could play in tackling new historiographical issues relating to France’s past. Panels were diverse and discussed themes such as “Race, Gender, and Class” or the problem of scale in French history, attempting to redefine the themes of Empire, Postcolonialism or Circulation. In total, five panels were held throughout the two days and were chaired by Dr Stephen Tyre, Dr Akhila Yechury, Mr Jordan Girardin, Dr Sarah Easterby-Smith (all from St Andrews) and Dr Simon Jackson from Birmingham. It is safe to say that a particular strength of this conference was the diversity of its speakers. A few came from afar (the award for longest journey going to Pr Tyler Stovall flying all the way from Berkeley), with others coming from a number of different British universities, while the Centre’s former Visiting Fellow Dr Junko Takeda joined the conversation via Skype from Syracuse. The question of nationality and language was also raised: with a very small minority of attendees being born and raised in France, how did this conference still manage to lead a convincing discussion on how the history of France should be written? A long roundtable discussion was held at the very end of the second day, establishing that French history could indeed find its future through pluridisciplinary studies. This conference provided an opportunity to remind attendees of the School’s research potential in terms of multidisciplinary approaches. Although the event was fully organised and run by the Centre for French History and Culture, the Centre for Transnational History (as of the start of this month, the Institute for Transnational History) was mentioned multiple times as one of the potential collaborators in order to offer new ways to write French history. Overall, the conference was an excellent start to this new academic year and we can expect more projects to emerge from the Centre for French History. Report kindly provided by Jordan Girardin.